The brilliant new novel from the international bestselling author of Home and Fool Me Once. Mistaken identities, dark family secrets and mysterious conspiracies lie at the heart of this gripping new thriller. Most people concluded it was a tragic suicide pact. The dead boy’s brother, Nap Dumas, did not. Now Nap is a cop – but he’s a cop who plays by his own rules, and who has never made peace with his past. I enjoyed Don’t Let Go very much. It’s a fast-paced mystery that moves between the past and the present with ease, good characterisation and a plot that kept me guessing to the end. Two stories relating to Coben’s hometown of New Jersey inspired him to write this story. One was about a mafia leader and a make-shift crematorium and the other about a Nike missile control centre behind barbed-wire fencing near the mafia leader’s house and the elementary school. 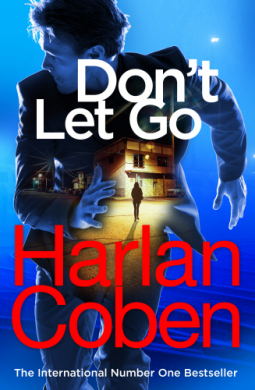 The stories turned out to be true, but Don’t Let Go is Coben’s own version. Nap has never got over his twin brother, Leo’s death and fifteen years later he is still constantly in his thoughts. Leo and his girlfriend, Diana had been found by a railway line and it looked as though they had committed suicide, but Nap can’t accept that. And he is still obsessed by his girlfriend, Maura, who had disappeared the same night that Leo died. So when another cop, Rex Canton is found dead with Maura’s fingerprints at the scene of the crime, Nap is determined to get to the truth of what exactly had happened and to find Maura. This is a book that I just had to read quickly, trying to follow the twists and turns as Nap and Ellie, also a friend from their schooldays, uncovered the secrets and lies that had been told over the years. I enjoyed Don’t Let Go, but it did remind me of the only other book by Coben that I’ve read – The Woods, also about the murder of two teenagers twenty years earlier. Two other teenagers had disappeared and were presumed dead. Paul Copeland, now a County Prosecutor, is asked to identify a dead body, who turns out to be one of the missing teenagers. His sister was the other missing person and she is still missing. Same story in principle but different details and I’m wondering if this is typical of Coben’s books? Are they formulaic? My thanks to NetGalley and Random House UK, Cornerstone, the publishers for a review copy. Yes, would be my answer to your question, which is why I gave up reading him. But some people find formulaic comforting so for them this would be a plus point. I thought so. It didn’t bother me for this book, as it was a while ago I’d read the earlier book and it didn’t strike me immediately but it’s put me off reading any more! I agree – yes they’re formulaic. That’s why I haven’t read them all and don’t grab them as soon as they come out, but I still love to turn to him when I need a bit of well-written entertainment. Glad you enjoyed this one, Margaret. I think some of Coben’s stuff does get formulaic, to be honest. But he’s worked out a formula that can draw the reader in. As FictionFan says, they’re great to turn to when you need dependable entertainment.